This article is about the vehicle used in agriculture or construction. For the power unit of a semi-trailer truck (articulated lorry), see Tractor unit. For other uses, see Tractor (disambiguation). Modern tractors, an Ursus 11054 and Fendt 820. A tractor pulling a chisel plow in Slovenia. A rubber tracked tractor pulling a disc harrow. A scale model of a modern Mahindra tractor in Punjab, India. Farm tractor in Balnain, Scotland. Alvin O. Lombard of Waterville, Maine, invented in 1901 a tractor for hauling logs, as displayed at the Maine State Museum in the capital city of Augusta. Known as "Lombard Log Haulers," these vehicles revolutionized logging in Maine. A tractor is an engineering vehicle specifically designed to deliver a high tractive effort (or torque) at slow speeds, for the purposes of hauling a trailer or machinery used in agriculture or construction. Most commonly, the term is used to describe a farm vehicle that provides the power and traction to mechanize agricultural tasks, especially (and originally) tillage, but nowadays a great variety of tasks. Agricultural implements may be towed behind or mounted on the tractor, and the tractor may also provide a source of power if the implement is mechanised. The word tractor was taken from Latin, being the agent noun of trahere "to pull". The first recorded use of the word meaning "an engine or vehicle for pulling wagons or ploughs" occurred in 1896, from the earlier term "traction engine" (1859). there are many types of tractors. But the main types are crawler and rubber wheeled tractors. In the UK, the Republic of Ireland, Australia, India, Spain, Argentina, Slovenia, Serbia, Croatia, the Netherlands, and Germany, the word "tractor" usually means "farm tractor", and the use of the word "tractor" to mean other types of vehicles is familiar to the vehicle trade, but unfamiliar to much of the general public. In Canada and the US, the word may also refer to the road tractor portion of a tractor trailer truck, but also usually refers to the piece of farm equipment. John Fowler pioneered the application of steam power to agriculture in the 1850s, and invented machines for ploughing and digging drainage channels. The first powered farm implements in the early 19th century were portable engines – steam engines on wheels that could be used to drive mechanical farm machinery by way of a flexible belt. Richard Trevithick designed the first 'semi-portable' stationary steam engine for agricultural use, known as a "barn engine" in 1812, and it was used to drive a corn threshing machine. The truly portable engine was invented in 1839 by William Tuxford of Boston, Lincolnshire who started manufacture of an engine built around a locomotive-style boiler with horizontal smoke tubes. A large flywheel was mounted on the crankshaft, and a stout leather belt was used to transfer the drive to the equipment being driven. In the 1850s, John Fowler used a Clayton & Shuttleworth portable engine to drive apparatus in the first public demonstrations of the application of cable haulage to cultivation. In parallel with the early portable engine development, many engineers attempted to make them self-propelled – the fore-runners of the traction engine. In most cases this was achieved by fitting a sprocket on the end of the crankshaft, and running a chain from this to a larger sprocket on the rear axle. These experiments met with mixed success. The first proper traction engine, in the form recognisable today, was developed in 1859 when British engineer Thomas Aveling modified a Clayton & Shuttleworth portable engine, which had to be hauled from job to job by horses, into a self-propelled one. The alteration was made by fitting a long driving chain between the crankshaft and the rear axle. 1882 Harrison Machine Works steam-powered traction engine. The first half of the 1860s was a period of great experimentation but by the end of the decade the standard form of the traction engine had evolved and would change little over the next sixty years. It was widely adopted for agricultural use. The first tractors were steam-powered plowing engines. They were used in pairs, placed on either side of a field to haul a plow back and forth between them using a wire cable. In Britain Mann's and Garrett developed steam tractors for direct ploughing, but the heavy, wet soil of England meant that these designs were less economical than a team of horses. In the United States, where soil conditions permitted, steam tractors were used to direct-haul plows. Steam-powered agricultural engines remained in use well into the 20th century until reliable internal combustion engines had been developed. Dan Albone with his 1902 prototype Ivel Agricultural Motor, the first successful gasoline-powered tractor. In 1892, John Froelich invented and built the first gasoline/petrol-powered tractor in Clayton County, Iowa, US. A Van Duzen single-cylinder gasoline engine was mounted on a Robinson engine chassis, which could be controlled and propelled by Froelich's gear box. After receiving a patent, Froelich started up the Waterloo Gasoline Engine Company and invested all of his assets. However, the venture was very unsuccessful, and by 1895 all was lost and he went out of business. Richard Hornsby & Sons are credited with producing and selling the first oil-engined tractor in Britain invented by Herbert Akroyd Stuart. The Hornsby-Akroyd Patent Safety Oil Traction Engine was made in 1896 with a 20 hp engine. In 1897, it was bought by Mr. Locke-King, and this is the first recorded sale of a tractor in Britain. Also in that year, the tractor won a Silver Medal of the Royal Agricultural Society of England. That tractor would later be returned to the factory and fitted with a caterpillar track. The first commercially successful light-weight petrol-powered general purpose tractor was built by Dan Albone, a British inventor in 1901. He filed for a patent on 15 February 1902 for his tractor design and then formed Ivel Agricultural Motors Limited. The other directors were Selwyn Edge, Charles Jarrott, John Hewitt and Lord Willoughby. He called his machine the Ivel Agricultural Motor; the word "tractor" did not come into common use until later. The Ivel Agricultural Motor was light, powerful and compact. It had one front wheel, with solid rubber tyre, and two large rear wheels like a modern tractor. The engine used water cooling, by evaporation. It had one forward and one reverse gear. A pulley wheel on the left hand side allowed it to be used as a stationary engine, driving a wide range of agricultural machinery. The 1903 sale price was £300. His tractor won a medal at the Royal Agricultural Show, in 1903 and 1904. About 500 were built, and many were exported all over the world. The original engine was made by Payne & Co. of Coventry. After 1906, French Aster engines were used. The first successful American tractor was built by Charles W. Hart and Charles H. Parr. They developed a two-cylinder gasoline engine and set up their business in Charles City, Iowa. In 1903, the firm built 15 tractors. Their 14,000-pound #3 is the oldest surviving internal combustion engine tractor in the United States, and is on display at the Smithsonian National Museum of American History in Washington, D.C. The two-cylinder engine has a unique hit-and-miss firing cycle that produced 30 horsepower at the belt and 18 at the drawbar. An early Fordson discing a field in Princess Anne County, Virginia, in 1925. In 1908, the Saunderson Tractor and Implement Co. of Bedford introduced a four-wheel design, and went on to become the largest tractor manufacturer in Britain at the time. While the earlier, heavier tractors were initially very successful, it became increasingly apparent at this time that the weight of a large supporting frame was less-efficient than lighter designs. Henry Ford introduced a light-weight, mass-produced design which largely displaced the heavier designs. Some companies halfheartedly followed suit with mediocre designs, as if to disprove the concept, but they were largely unsuccessful in that endeavor. While unpopular at first, these gasoline-powered machines began to catch on in the 1910s, when they became smaller and more affordable. Henry Ford introduced the Fordson, a wildly popular mass-produced tractor, in 1917. They were built in the U.S., Ireland, England and Russia, and by 1923, Fordson had 77% of the U.S. market. The Fordson dispensed with a frame, using the strength of the engine block to hold the machine together. By the 1920s, tractors with gasoline-powered internal combustion engines had become the norm. Tractor Cassani model 40HP, at the Museo nazionale della scienza e della tecnologia Leonardo da Vinci of Milan. Harry Ferguson applied for a British patent for his three-point hitch in 1926, a three-point attachment of the implement to the tractor and the simplest and the only statically determinate way of joining two bodies in engineering. The Ferguson-Brown Company produced the Model A Ferguson-Brown tractor with a Ferguson-designed hydraulic hitch. In 1938 Ferguson entered into a collaboration with Henry Ford to produce the Ford-Ferguson 9N tractor. The three-point hitch soon became the favorite hitch attachment system among farmers around the world. This tractor model also included a rear Power Take Off (PTO) shaft that could be used to power three point hitch mounted implements such as sickle-bar mowers. This PTO location set the standard for future tractor developments. Tractors can be generally classified by number of axles or wheels, with main categories of two-wheel tractors (single-axle tractors) and four-wheel tractors (two-axle tractors); more axles are possible but uncommon. Among four-wheel tractors (two-axle tractors), most are two-wheel drive (usually at the rear); but many are two-wheel drive with front wheel assist, four-wheel drive (often with articulated steering), or track tractors (with steel or rubber tracks). Four-wheel drive tractors began to appear in the 1960s. Some four-wheel drive tractors have the standard "two large, two small" configuration typical of smaller tractors, while some have four large, powered wheels. The larger tractors are typically an articulated, center-hinged design steered by hydraulic cylinders that move the forward power unit while the trailing unit is not steered separately. In the early 21st century, articulated or non-articulated, steerable multitrack tractors have largely supplanted the Caterpillar type for farm use. Larger types of modern farm tractors include articulated four-wheel or eight-wheel drive units with one or two power units which are hinged in the middle and steered by hydraulic clutches or pumps. A relatively recent development is the replacement of wheels or steel crawler-type tracks with flexible, steel-reinforced rubber tracks, usually powered by hydrostatic or completely hydraulic driving mechanisms. The configuration of these tractors bears little resemblance to the classic farm tractor design. The predecessors of modern tractors, traction engines, used steam engines for power. Since the turn of the 20th century, internal combustion engines have been the power source of choice. 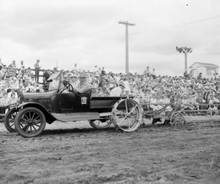 Between 1900 and 1960, gasoline was the predominant fuel, with kerosene (the Rumely Oil Pull was the most notable of this kind) and ethanol being common alternatives. Generally, one engine could burn any of those, although cold starting was easiest on gasoline. Often, a small auxiliary fuel tank was available to hold gasoline for cold starting and warm-up, while the main fuel tank held whatever fuel was most convenient or least expensive for the particular farmer. In the United Kingdom, a gasoline-kerosene engine is known as a petrol-paraffin engine. Dieselisation gained momentum starting in the 1960s, and modern farm tractors usually employ diesel engines, which range in power output from 18 to 575 horsepower (15 to 480 kW). Size and output are dependent on application, with smaller tractors used for lawn mowing, landscaping, orchard work, and truck farming, and larger tractors for vast fields of wheat, maize, soy, and other bulk crops. Liquified petroleum gas (LPG) or propane also have been used as tractor fuels, but require special pressurized fuel tanks and filling equipment, so are less prevalent in most markets. In some countries such as Germany, biodiesel is often used. Some other biofuels such as straight vegetable oil are also being used by some farmers. Most older farm tractors use a manual transmission with several gear ratios, typically three to six, sometimes multiplied into two or three ranges. This arrangement provides a set of discrete ratios that, combined with the varying of the throttle, allow final-drive speeds from less than one up to about 25 miles per hour (40 km/h), with the lower speeds used for working the land and the highest speed used on the road. Slow, controllable speeds are necessary for most of the operations performed with a tractor. They help give the farmer a larger degree of control in certain situations, such as field work. However, when travelling on public roads, the slow operating speeds can cause problems, such as long queues or tailbacks, which can delay or annoy motorists in cars and trucks. These motorists are responsible for being duly careful around farm tractors and sharing the road with them, but many shirk this responsibility, so various ways to minimize the interaction or minimize the speed differential are employed where feasible. Some countries (for example the Netherlands) employ a road sign on some roads that means "no farm tractors". Some modern tractors, such as the JCB Fastrac, are now capable of much higher road speeds of around 50 mph (80 km/h). Older tractors usually have unsynchronized transmission designs, which often require the operator stop the tractor to shift between gears. This mode of use is inherently unsuited to some of the work tractors do, and has been circumvented in various ways over the years. For existing unsynchronized tractors, the methods of circumvention are double clutching or power-shifting, both of which require the operator to rely on skill to speed-match the gears while shifting, and are undesirable from a risk-mitigation standpoint because of what can go wrong if the operator makes a mistake – transmission damage is possible, and loss of vehicle control can occur if the tractor is towing a heavy load either uphill or downhill – something that tractors often do. Therefore, operator's manuals for most of these tractors state one must always stop the tractor before shifting, and they do not even mention the alternatives. As already said, that mode of use is inherently unsuited to some of the work tractors do, so better options were pursued for newer tractor designs. In these, unsynchronized transmission designs were replaced with synchronization or with continuously variable transmissions (CVTs). Either a synchronized manual transmission with enough available gear ratios (often achieved with dual ranges, high and low) or a CVT allow the engine speed to be matched to the desired final-drive speed, while keeping engine speed within the appropriate speed (as measured in rotations per minute or rpm) range for power generation (the working range) (whereas throttling back to achieve the desired final-drive speed is a trade-off that leaves the working range). The problems, solutions, and developments described here also describe the history of transmission evolution in semi-trailer trucks. The biggest difference is fleet turnover; whereas most of the old road tractors have long since been scrapped, many of the old farm tractors are still in use. Therefore, old transmission design and operation is primarily just of historical interest in trucking, whereas in farming it still often affects daily life. The power produced by the engine must be transmitted to the implement or equipment to do the actual work intended for the equipment. This may be accomplished via a drawbar or hitch system if the implement is to be towed or otherwise pulled through the tractive power of the engine, or via a pulley or power takeoff system if the implement is stationary, or a combination of the two. Until the 1940s, plows and other tillage equipment usually were connected to the tractor via a drawbar. The classic drawbar is simply a steel bar attached to the tractor (or in some cases, as in the early Fordsons, cast as part of the rear transmission housing) to which the hitch of the implement was attached with a pin or by a loop and clevis. The implement could be readily attached and removed, allowing the tractor to be used for other purposes on a daily basis. If the tractor was equipped with a swinging drawbar, then it could be set at the center or offset from center to allow the tractor to run outside the path of the implement. The drawbar system necessitated the implement having its own running gear (usually wheels) and in the case of a plow, chisel cultivator or harrow, some sort of lift mechanism to raise it out of the ground at turns or for transport. Drawbars necessarily posed a rollover risk depending on how the tractive torque was applied. The Fordson tractors (of which more units were produced and placed in service than any other farm tractor) was extremely prone to roll over backwards due to an excessively short wheelbase. The linkage between the implement and the tractor usually had some slack which could lead to jerky starts and greater wear and tear on the tractor and the equipment. Drawbars were appropriate to the dawn of mechanization, because they were very simple in concept and because as the tractor replaced the horse, existing horse-drawn implements usually already had running gear. As the history of mechanization progressed, however, the advantages of other hitching systems became apparent, leading to new developments (see below). Depending on the function for which a tractor is used, though, the drawbar is still one of the usual means of attaching an implement to a tractor (see photo at left). Some tractor manufacturers produced matching equipment that could be directly mounted on the tractor. Examples included front-end loaders, belly mowers, row crop cultivators, corn pickers and corn planters. In most cases, these fixed mounts were proprietary and unique to each make of tractor, so an implement produced by John Deere, for example, could not be attached to a Minneapolis Moline tractor. Another disadvantage was mounting usually required some time and labor, resulting in the implement being semi-permanently attached with bolts or other mounting hardware. Usually, it was impractical to remove the implement and reinstall it on a day-to-day basis. As a result, the tractor was unavailable for other uses and dedicated to a single use for an appreciable period of time. An implement generally would be mounted at the beginning of its season of use (such as tillage, planting or harvesting) and removed only when the likely use season had ended. The drawbar system was virtually the exclusive method of attaching implements (other than direct attachment to the tractor) before Harry Ferguson developed the three-point hitch. Equipment attached to the three-point hitch can be raised or lowered hydraulically with a control lever. The equipment attached to the three-point hitch is usually completely supported by the tractor. Another way to attach an implement is via a quick hitch, which is attached to the three-point hitch. This enables a single person to attach an implement quicker and put the person in less danger when attaching the implement. The three-point hitch revolutionized farm tractors and their implements. While the Ferguson system was still under patent, other manufacturers developed new hitching systems to try to fend off some of Ferguson's competitive advantage. For example, International Harvestor's Farmall tractors gained a two-point "Fast Hitch", and John Deere had a power lift that was similar to, but not as flexible as, the Ferguson invention. Once the patent protection expired on the three-point hitch, it became an industry standard. Almost every tractor today features Ferguson's three-point linkage or a derivative of it. This hitch allows for easy attachment and detachment of implements while allowing the implement to function as a part of the tractor, almost as if it were attached by a fixed mount. Previously, when the implement hit an obstacle, the towing link would break or the tractor could flip over. Ferguson's genius was to combine a connection via two lower and one upper lift arms that were connected to a hydraulic lifting ram. The ram was, in turn, connected to the upper of the three links so the increased drag (as when a plough hits a rock) caused the hydraulics to lift the implement until the obstacle was passed. Recently, Bobcat's patent on its front loader connection (inspired by these earlier systems) has expired, and compact tractors are now being outfitted with quick-connect attachments for their front-end loaders. In addition to towing an implement or supplying tractive power through the wheels, most tractors have a means to transfer power to another machine such as a baler, swather, or mower. Unless it functions solely by pulling it through or over the ground, a towed implement needs its own power source (such as a baler or combine with a separate engine) or else a means of transmitting power from the tractor to the mechanical operations of the equipment. Early tractors used belts or cables wrapped around the flywheel or a separate belt pulley to power stationary equipment, such as a threshing machine, buzz saw, silage blower, or stationary baler. In most cases, it was not practical for the tractor and equipment to move with a flexible belt or cable between them, so this system required the tractor to remain in one location, with the work brought to the equipment, or the tractor to be relocated at each turn and the power set-up reapplied (as in cable-drawn plowing systems used in early steam tractor operations). Modern tractors use a power take-off (PTO) shaft to provide rotary power to machinery that may be stationary or pulled. The PTO shaft generally is at the rear of the tractor, and can be connected to an implement that is either towed by a drawbar or a three-point hitch. This eliminates the need for a separate, implement-mounted power source, which is almost never seen in modern farm equipment. It is also optional to get a front PTO as well when buying a new tractor. Virtually all modern tractors can also provide external hydraulic fluid and electrical power to the equipment they are towing, either by hoses or wires. Modern tractors have many electrical switches and levers in the cab for controlling the multitude of different functions available on the tractor. Modern farm tractors usually have four or five foot-pedals for the operator on the floor of the tractor. The pedal on the left is the clutch. The operator presses on this pedal to disengage the transmission for either shifting gears or stopping the tractor. Some modern tractors have (or as optional equipment) a button on the gear stick for controlling the clutch, in addition to the standard pedal. Two of the pedals on the right are the brakes. The left brake pedal stops the left rear wheel and the right brake pedal does the same with the right side. This independent left and right wheel-braking augments the steering of the tractor when only the two rear wheels are driven. This is usually done when it is necessary to make a sharp turn. The split brake pedal is also used in mud or soft soil to control a tire spinning due to loss of traction. The operator presses both pedals together to stop the tractor. Usually a swinging or sliding bolt is provided to lock the two together when desired. The pedal furthest to the right is the foot throttle. Unlike in automobiles, it can also be controlled from a hand-operated lever ("hand throttle"). This helps provide a constant speed in field work. It also helps provide continuous power for stationary tractors that are operating an implement by shaft or belt. The foot throttle gives the operator more automobile-like control over the speed of the tractor for road work. This is a feature of more recent tractors; older tractors often did not have it. In the UK, foot pedal use to control engine speed while travelling on the road is mandatory. Some tractors, especially those designed for row-crop work, have a 'de-accelerator' pedal, which operates in the reverse fashion to an automobile throttle, in that the pedal is pushed down to slow the engine. This allows fine control over the speed of the tractor when maneuvering at the end of crop rows in fields- the operating speed of the engine is set using the hand throttle, and to slow the tractor to turn, the operator simply has to press the pedal, and turn and release it once the turn is completed, rather than having to alter the setting of the hand throttle twice during the maneuver. A fifth pedal is traditionally included just in front of the driver's seat (often pressed with the operator's heel) to operate the rear differential lock (diff-lock), which prevents wheel slip. The differential normally allows the outside wheel to travel faster than the inside wheel during a turn. However, in low-traction conditions on a soft surface, the same mechanism could allow one wheel to slip, further reducing traction. The diff-lock overrides this, forcing both wheels to turn at the same speed, reducing wheel slip and improving traction. Care must be taken to unlock the differential before turning, usually by hitting the pedal a second time, since the tractor with good traction cannot perform a turn with the diff-lock engaged. In modern tractors, this pedal is replaced with an electrical switch. Many functions once controlled with levers have been replaced with some model of electrical switch with the rise of indirect computer controlling of functions in modern tractors. Until the beginning of the 1960s, tractors had a single register of gears, hence one gear stick, often with three to five forward gears and 1 reverse. Then, group gears were introduced, and another gear stick was added. Later, control of the forward-reverse direction was moved to a special stick attached at the side of the steering wheel, which allowed forward or reverse travel in any gear. Nowadays, with CVTs or other clutch-free gear types, fewer sticks control the transmission, and some are replaced with electrical switches or are totally computer-controlled. The three-point hitch was controlled with a lever for adjusting the position, or as with the earliest ones, just the function for raising or lowering the hitch. With modern electrical systems, it is often replaced with a potentiometer for the lower bound position and another one for the upper bound, and a switch allowing automatic adjustment of the hitch between these settings. The external hydraulics also originally had levers, but now are often replaced with some form of electrical switch; the same is true for the power take-off shaft. The classic row crop tractor (an Allis-Chalmers WD). Note the absence of any rollover protection system. Agriculture in the United States is one of the most hazardous industries, only surpassed by mining and construction. No other farm machine is so identified with the hazards of production agriculture as the tractor. Tractor-related injuries account for approximately 32% of the fatalities and 6% of the nonfatal injuries in agriculture. Over 50% is attributed to tractor overturns. The roll-over protection structure (ROPS) and seat belt, when worn, are the most important safety devices to protect operators from death during tractor overturns. Modern tractors have a ROPS to prevent an operator from being crushed if the tractor turns over. The ROPS does not prevent tractor overturns; rather, it prevents the operator from being crushed during an overturn. This is especially important in open-air tractors, where the ROPS is a steel beam that extends above the operator's seat. For tractors with operator cabs, the ROPS is part of the frame of the cab. A ROPS with enclosed cab further reduces the likelihood of serious injury because the operator is protected by the sides and windows of the cab. These structures were first required by legislation in Sweden in 1959. Before they were required, some farmers died when their tractors rolled on top of them. Row-crop tractors, before ROPS, were particularly dangerous because of their 'tricycle' design with the two front wheels spaced close together and angled inward toward the ground. Some farmers were killed by rollovers while operating tractors along steep slopes. Others have been killed while attempting to tow or pull an excessive load from above axle height, or when cold weather caused the tires to freeze to the ground, in both cases causing the tractor to pivot around the rear axle. ROPS were first required in the United States in 1986, but this requirement did not retroactively apply to tractors produced before this year; therefore, adoption of ROPS has been incomplete in the farming community. To combat this problem, CROPS (cost-effective roll-over protection structures) have been developed to encourage farmers to retrofit older tractors. For the ROPS to work as designed, the operator must stay within its protective frame. This means the operator must wear the seat belt; not wearing it may defeat the primary purpose of the ROPS. The most common use of the term "tractor" is for the vehicles used on farms. The farm tractor is used for pulling or pushing agricultural machinery or trailers, for plowing, tilling, disking, harrowing, planting, and similar tasks. A variety of specialty farm tractors have been developed for particular uses. These include "row crop" tractors with adjustable tread width to allow the tractor to pass down rows of corn, tomatoes or other crops without crushing the plants, "wheatland" or "standard" tractors with fixed wheels and a lower center of gravity for plowing and other heavy field work for broadcast crops, and "high crop" tractors with adjustable tread and increased ground clearance, often used in the cultivation of cotton and other high-growing row crop plant operations, and "utility tractors", typically smaller tractors with a low center of gravity and short turning radius, used for general purposes around the farmstead. Many utility tractors are used for nonfarm grading, landscape maintenance and excavation purposes, particularly with loaders, backhoes, pallet forks and similar devices. Small garden or lawn tractors designed for suburban and semirural gardening and landscape maintenance also exist in a variety of configurations. Some farm-type tractors are found elsewhere than on farms: with large universities' gardening departments, in public parks, or for highway workman use with blowtorch cylinders strapped to the sides and a pneumatic drill air compressor permanently fastened over the power take-off. These are often fitted with grass (turf) tyres which are less damaging to soft surfaces than agricultural tires. Space technology has been incorporated into agriculture in the form of GPS devices, and robust on-board computers installed as optional features on farm tractors. These technologies are used in modern, precision farming techniques. The spin-offs from the space race have actually facilitated automation in plowing and the use of autosteer systems (drone on tractors that are manned but only steered at the end of a row), the idea being to neither overlap and use more fuel nor leave streaks when performing jobs such as cultivating. Several tractor companies have also been working on producing a driverless tractor. Ebro farm tractor with steel wheel extensions. This arrangement is often used in muddy conditions that are found in paddy farming of rice. The durability and engine power of tractors made them very suitable for engineering tasks. Tractors can be fitted with engineering tools such as dozer blades, buckets, hoes, rippers, etc. The most common attachments for the front of a tractor are dozer blades or buckets. When attached to engineering tools, the tractor is called an engineering vehicle. A bulldozer is a track-type tractor with a blade attached in the front and a rope-winch behind. Bulldozers are very powerful tractors and have excellent ground-hold, as their main tasks are to push or drag. Bulldozers have been further modified over time to evolve into new machines which are capable of working in ways that the original bulldozer can not. One example is that loader tractors were created by removing the blade and substituting a large volume bucket and hydraulic arms which can raise and lower the bucket, thus making it useful for scooping up earth, rock and similar loose material to load it into trucks. A front-loader or loader is a tractor with an engineering tool which consists of two hydraulic powered arms on either side of the front engine compartment and a tilting implement. This is usually a wide-open box called a bucket, but other common attachments are a pallet fork and a bale grappler. Other modifications to the original bulldozer include making the machine smaller to let it operate in small work areas where movement is limited. Also, tiny wheeled loaders, officially called skid-steer loaders, but nicknamed "Bobcat" after the original manufacturer, are particularly suited for small excavation projects in confined areas. A common backhoe-loader – the backhoe is on the left, the bucket/blade on the right. The most common variation of the classic farm tractor is the hoe, also called a hoe-loader. As the name implies, it has a loader assembly on the front and a backhoe on the back. Backhoes attach to a three-point hitch on farm or industrial tractors. Industrial tractors are often heavier in construction, particularly with regards to the use of steel grill for protection from rocks and the use of construction tires. When the backhoe is permanently attached, the machine usually has a seat that can swivel to the rear to face the hoe controls. Removable backhoe attachments almost always have a separate seat on the attachment. Backhoe-loaders are very common and can be used for a wide variety of tasks: construction, small demolitions, light transportation of building materials, powering building equipment, digging holes, loading trucks, breaking asphalt and paving roads. Some buckets have retractable bottoms, enabling them to empty their loads more quickly and efficiently. Buckets with retractable bottoms are also often used for grading and scratching off sand. The front assembly may be a removable attachment or permanently mounted. Often the bucket can be replaced with other devices or tools. Their relatively small frames and precise controls make backhoe-loaders very useful and common in urban engineering projects, such as construction and repairs in areas too small for larger equipment. Their versatility and compact size makes them one of the most popular urban construction vehicles. In the UK and Ireland, the word "JCB" is used colloquially as a genericized trademark for any such type of engineering vehicle. The term JCB now appears in the Oxford English Dictionary, although it is still legally a trademark of J. C. Bamford Ltd. The term "digger" is also commonly used. A compact utility tractor (CUT) is a smaller version of an agricultural tractor, but designed primarily for landscaping and estate management tasks rather than for planting and harvesting on a commercial scale. Typical CUTs range from 20 to 50 horsepower (15–37 kW) with available power take-off (PTO) horsepower ranging from 15 to 45 hp (11–34 kW). CUTs are often equipped with both a mid-mounted and a standard rear PTO, especially those below 40 horsepower (30 kW). The mid-mount PTO shaft typically rotates at/near 2000 rpm and is typically used to power mid-mount finish mowers, front-mounted snow blowers or front-mounted rotary brooms. The rear PTO is standardized at 540 rpms for the North American markets, but in some parts of the world, a dual 540/1000 rpm PTO is standard, and implements are available for either standard in those markets. One of the most common attachment for a CUT is the front-end loader or FEL. Like the larger agricultural tractors, a CUT will have an adjustable, hydraulically controlled three-point hitch. Typically, a CUT will have four-wheel drive, or more correctly four-wheel assist. Modern CUTs often feature hydrostatic transmissions, but many variants of gear-drive transmissions are also offered from low priced, simple gear transmissions to synchronized transmissions to advanced glide-shift transmissions. All modern CUTs feature government-mandated roll over protection structures just like agricultural tractors. The most well-known brands in North America include Kubota, John Deere Tractor, New Holland Ag, Case-Farmall and Massey-Ferguson. Although less common, compact backhoes are often attached to compact utility tractors. Compact utility tractors require special, smaller implements than full-sized agricultural tractors. Very common implements include the box blade, the grader blade, the landscape rake, the post hole digger (or post hole auger), the rotary cutter (slasher or a brush hog), a mid- or rear-mount finish mower, a broadcast seeder, a subsoiler and the rototiller (rotary tiller). In northern climates, a rear-mounted snow blower is very common; some smaller CUT models are available with front-mounted snow blowers powered by mid-PTO shafts. Implement brands outnumbere tractor brands, so CUT owners have a wide selection of implements. For small-scale farming or large-scale gardening, some planting and harvesting implements are sized for CUTs. One- and two-row planting units are commonly available, as are cultivators, sprayers and different types of seeders (slit, rotary and drop). One of the first CUTs offered for small farms of three to 30 acres and for small jobs on larger farms was a three-wheeled unit, with the rear wheel being the drive wheel, offered by Sears & Roebuck in 1954 and priced at $598 for the basic model. The earliest tractors were called "standard" tractors, and were intended almost solely for plowing and harrowing before planting, which were difficult tasks for humans and draft animals. They were characterized by a low, rearward seating position, fixed-width tread, and low ground clearance. These early tractors were cumbersome, and were not well-suited to getting into a field of already-planted row crops to do weed control. The "standard" tractor definition is no longer in current use. A general-purpose or row-crop tractor is tailored specifically to the growing of crops grown in rows, and most especially to cultivating these crops. These tractors are universal machines, capable of both primary tillage and cultivation of a crop. The "row-crop" or "general-purpose" designation is no longer in current use. The row-crop tractor category evolved rather than appearing overnight, but the International Harvester (IH) Farmall is often considered the "first" tractor of the category. Some earlier tractors of the 1910s and 1920s approached the form factor from the heavier side, as did motorized cultivators from the lighter side, but the Farmall brought all of the salient features together into one package, with a capable distribution network to ensure its commercial success. In the new form factor that the Farmall popularized, the cultivator was mounted in the front so it was easily visible. Additionally, the tractor had a narrow front end; the front tires were spaced very closely and angled in towards the bottom. The back wheels straddled two rows, and the unit could cultivate four rows at once. From 1924 until 1963, Farmalls were the largest selling row-crop tractors. To compete, John Deere designed the Model C, which had a wide front and could cultivate three rows at once. Only 112 prototypes were made, as Deere realized sales would be lost to Farmall if their model did less. In 1928, Deere released the Model C anyway, only as the Model GP (General Purpose) to avoid confusion with the Model D when ordered over the then unclear telephone. Oliver refined its "Row Crop" model early in 1930. Until 1935, the 18–27 was Oliver–Hart-Parr's only row-crop tractor. Many Oliver row-crop models are referred to as "Oliver Row Crop 77", "Oliver Row Crop 88", etc. Many early row-crop tractors had a tricycle design with two closely spaced front tires, and some even had a single front tire. This made it dangerous to operate on the side of a steep hill; as a result, many farmers died from tractor rollovers. Also, early row-crop tractors had no rollover protection system (ROPS), meaning if the tractor flipped back, the operator could be crushed. Sweden was the first country which passed legislation requiring ROPS, in 1959. Over 50% of tractor related injuries and deaths are attributed to tractor rollover. Canadian agricultural equipment manufacturer Versatile makes row-crop tractors that are 265 to 365 horsepower (198 to 272 kW); powered by an 8.9 liter Cummins Diesel engine. Case IH and New Holland of CNH Industrial both produce high horsepower front-wheel-assist row crop tractors with available rear tracks. Case IH also has a 500 hp (373 kW) four-wheel drive track system called Rowtrac. John Deere has an extensive line of available row crop tractors ranging from 140 to 400 horsepower (104 to 298 kW). Modern row crop tractors have rollover protection systems in the form of a reinforced cab or a roll bar. Garden tractors (mini tractors) are small, light tractors designed for use in domestic gardens and small estates. Garden tractors are designed for cutting grass, snow removal, and small property cultivation. In the U.S., the term riding lawn mower today often is used to refer to mid- or rear-engined machines. Front-engined tractor layout machines designed primarily for cutting grass and light towing are called lawn tractors; heavier-duty tractors of similar size are garden tractors. Garden tractors are capable of mounting a wider array of attachments than lawn tractors. Unlike lawn tractors and rear-engined riding mowers, garden tractors are powered by horizontal-crankshaft engines with a belt-drive to transaxle-type transmissions (usually of four- or five-speeds, although some may also have two-speed reduction gearboxes, drive-shafts, or hydrostatic or hydraulic drives). Garden tractors from Wheel Horse, Cub Cadet, Economy (Power King), John Deere, Massey Ferguson and Case Ingersoll are built in this manner. The engines are generally a one- or two-cylinder petrol (gasoline) engines, although diesel engine models are also available, especially in Europe. Typically, diesel-powered garden tractors are larger and heavier-duty than gasoline-powered units and compare more similarly to compact utility tractors. Visually, the distinction between a garden tractor and a lawn tractor is often hard to make – generally, garden tractors are more sturdily built, with stronger frames, 12-inch or larger wheels mounted with multiple lugs (most lawn tractors have a single bolt or clip on the hub), heavier transaxles, and ability to accommodate a wide range of front, belly, and rear mounted attachments. Although most people think first of four-wheel vehicles when they think of tractors, a tractor may have one or more axles. The key benefit is the power itself, which only takes one axle to provide. Single-axle tractors, more often called two-wheel tractors or walk-behind tractors, have had many users since the beginning of internal combustion engine tractors. They tend to be small and affordable. This was especially true before the 1960s, when a walk-behind tractor could often be more affordable than a two-axle tractor of comparable power. Today's compact utility tractors and advanced garden tractors may negate most of that market advantage, but two-wheel tractors still enjoy a loyal following, especially where an already-paid-for two-wheel tractor is financially superior to a compact or garden tractor that would have to be purchased. Countries where two-wheel tractors are especially prevalent today include, Thailand, China, Bangladesh, India, and other Southeast Asia countries. Tractors tailored to use in fruit orchards typically have features suited to passing under tree branches with impunity. These include a lower overall profile; reduced tree-branch-snagging risk (via underslung exhaust pipes rather than smoke-stack-style exhaust, and large sheetmetal cowlings and fairings that allow branches to deflect and slide off rather than catch); spark arrestors on the exhaust tips; and often wire cages to protect the operator from snags. A Model T tractor pulling a plow. An advertisement for auto-to-tractor conversion kits, 1918. A Volvo Duett rebuilt to an EPA tractor, obviously the intended use is no longer as a farm vehicle. An "A tractor" based on Volvo 760 – notice the slow-vehicle triangle and the longer boot. The ingenuity of farm mechanics, coupled in some cases with OEM or aftermarket assistance, has often resulted in the conversion of automobiles for use as farm tractors. In the United States, this trend was especially strong from the 1910s through 1950s. It began early in the development of vehicles powered by internal combustion engines, with blacksmiths and amateur mechanics tinkering in their shops. 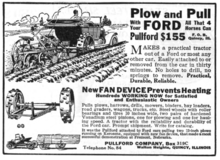 Especially during the interwar period, dozens of manufacturers (Montgomery Ward among them) marketed aftermarket kits for converting Ford Model Ts for use as tractors. (These were sometimes called 'Hoover wagons' during the Great Depression, although this term was usually reserved for automobiles converted to horse-drawn buggy use when gasoline was unavailable or unaffordable. During the same period, another common name was "Doodlebug"). Ford even considered producing an "official" optional kit. Many Model A Fords also were converted for this purpose. In later years, some farm mechanics have been known to convert more modern trucks or cars for use as tractors, more often as curiosities or for recreational purposes (rather than out of the earlier motives of pure necessity or frugality). During World War II, a shortage of tractors in Sweden led to the development of the so-called "EPA" tractor (EPA was a chain of discount stores and it was often used to signify something lacking in quality). An EPA tractor was simply an automobile, truck or lorry, with the passenger space cut off behind the front seats, equipped with two gearboxes in a row. When done to an older car with a ladder frame, the result was not dissimilar to a tractor and could be used as one. After the war it remained popular, now not as a farm vehicle, but as a way for young people without a driver's license to own something similar to a car. Since it was legally seen as a tractor, it could be driven from 16 years of age and only required a tractor license. Eventually, the legal loophole was closed and no new EPA tractors were allowed to be made, but the remaining ones were still legal, which led to inflated prices and many protests from people who preferred EPA tractors to ordinary cars. The German occupation of Italy during World War II resulted in a severe shortage of mechanized farm equipment. The destruction of tractors was a sort of scorched-earth strategy used to reduce the independence of the conquered. The shortage of tractors in that area of Europe was the origin of Lamborghini. The war was also the inspiration for dual-purpose vehicles such as the Land Rover. Based on the Jeep, the company made a vehicle that combined PTO, tillage, and transportation. In March 1975, a similar type of vehicle was introduced in Sweden, the A tractor [from arbetstraktor (work tractor)]; the main difference is an A tractor has a top speed of 30 km/h. This is usually done by fitting two gearboxes in a row and not using one of them. The Volvo Duett was, for a long time, the primary choice for conversion to an EPA or A tractor, but since supplies have dried up, other cars have been used, in most cases another Volvo. The SFRO is a Swedish organization advocating homebuilt and modified vehicles. Another type of homemade tractors are ones that are fabricated from scratch. The "from scratch" description is relative, as often individual components will be repurposed from earlier vehicles or machinery (e.g., engines, gearboxes, axle housings), but the tractor's overall chassis is essentially designed and built by the owner (e.g., a frame is welded from bar stock—channel stock, angle stock, flat stock, etc.). As with automobile conversions, the heyday of this type of tractor, at least in developed economies, lies in the past, when there were large populations of blue-collar workers for whom metalworking and farming were prevalent parts of their lives. (For example, many 19th- and 20th-century New England and Midwestern machinists and factory workers had grown up on farms.) Backyard fabrication was a natural activity to them (whereas it might seem daunting to most people today). Road tractors, tractor units or traction heads, familiar as the front end of an articulated lorry / semi-trailer truck. They are heavy-duty vehicles with large engines and several axles. The majority of these tractors are designed to pull long semi-trailers, most often to transport freight over a significant distance, and is connected to the trailer with a fifth wheel coupling. In England, this type of "tractor" is often called an "artic cab" (short for "articulated" cab). A minority is the ballast tractor, whose load is hauled from a drawbar. Pushback tractors are used on airports to move aircraft on the ground, most commonly pushing aircraft away from their parking stands. Artillery tractors – vehicles used to tow artillery pieces of varying weights. NASA and other space agencies use very large tractors to move large launch vehicles and space shuttles between their hangars and launch pads. A pipe-tractor is a device used for conveying advanced instruments into pipes for measurement and data logging, and the purging of well holes, sewer pipes and other inaccessible tubes. Nebraska tractor tests: Tests, mandated by the Nebraska Tractor Test Law and administered by the University of Nebraska, that objectively test the performance of all brands of tractors, 40 horsepower or more, sold in Nebraska. In the 1910s and 1920s, an era of snake oil sales and advertising tactics, the Nebraska tests helped farmers throughout North America to see through marketing claims and make informed buying decisions. The tests continue today, making sure tractors fulfill the manufacturer's advertised claims. Tractor war(s), Great tractor war(s): A period of ruinous competition and price warring between tractor manufacturers in the 1920s, which led to a consolidation in the industry. In addition to commercial manufacturers, the Open Source Ecology group has developed several working prototypes of an open source hardware tractor called the LifeTrac as part of its Global Village Construction Set. The First Tractor, a painting by Vladimir Krikhatsky. ^ Houghton Mifflin (2000). The American Heritage Dictionary of the English Language (4th ed.). Boston and New York: Houghton Mifflin. p. 1829. ISBN 978-0-395-82517-4. ^ Merriam-Webster Unabridged (MWU). (Online subscription-based reference service of Merriam-Webster, based on Webster's Third New International Dictionary, Unabridged. Merriam-Webster, 2002.) Headword tractor. Accessed 2007-09-22. ^ "Tractor". (etymology). Online Etymology Dictionary. Retrieved 2017-08-20. ^ Hodge, James (1973). Richard Trevithick (Lifelines 6). Shire Publications. p. 30. ISBN 978-0-85263-177-5. ^ Lane, Michael R. Pride of the Road. p. 56. ^ Bonnett, Harold (1975). Discovering Traction Engines. Shire Publications Ltd. p. 5. ISBN 978-0-85263-318-2. ^ "Tractors in the 1930s". ^ The John Deere Tractor Legacy. Voyageur Press. p. 45. ISBN 9781610605298. ^ Vintage Farm Tractors. Voyageur Press. p. 14. ISBN 9781610605649. ^ Xulon Press. Xulon Press. June 2002. ISBN 978-1-59160-134-0. ^ Ultimate John Deere: The History of the Big Green Machines. Voyageur Press. 2001. p. 52. ISBN 9781610605588. ^ "Froelich Tractor". Froelich Foundation. ^ "Gasoline Tractor". Iowa Pathways. 2016-08-17. ^ "From Steam to Gasoline…". Inspired Media. 2009-08-21. Archived from the original on 2012-02-24. Retrieved 2010-07-19. ^ "Dan Albone, English inventor, 1902". The Science and Society Picture Library. Retrieved 2013-08-30. ^ "Dan Albone". Biggleswade History Society. Archived from the original on 2012-03-15. Retrieved 2013-08-30. ^ "Smithsonian Museum of American History". Hart Parr #3. Retrieved 2010-11-29. ^ Irwin, Amy; Poots, Jill (12 Apr 2018). "Investigation of UK Farmer Go/No-Go Decisions in Response to Tractor-Based Risk Scenarios". Journal of Agromedicine. 23 (2): 154–165. doi:10.1080/1059924X.2017.1423000. PMID 29648955. ^ a b Donham, K., D. Osterberg,, M.L/ Meyers, and C. Lehtola. 1999. Final report tractor risk abatement and control: the policy conference, September 10–12, 1997. The University of Iowa, Iowa City, Iowa. ^ Rudolphi, Josie M.; Campo, Shelly; Gerr, Fred; Rohlman, Diane S. (2018-05-01). "Social and Individual Influences on Tractor Operating Practices of Young Adult Agricultural Workers". Journal of Adolescent Health. 62 (5): 605–611. doi:10.1016/j.jadohealth.2017.11.300. ISSN 1054-139X. PMID 29478719. ^ a b Keane, Paul R.; McKenzie, Tony (30 April 2013). "Cost-effective Rollover Protective Structure (CROPS)". National Institute for Occupational Safety and Health. Retrieved 21 January 2015. ^ "Tragedy averted: 90-second video speaks to Wisconsin farmers". Wisconsin State Farmer. Retrieved 2018-05-03. ^ "Three Wheeled Tractor With Implements Handles Small-Farm Work." Popular Mechanics, June 1954, p. 96. ^ Klancher et al. 2003. ^ "Tractors Advance during the Depression". Livinghistoryfarm.org. Retrieved 2010-07-29. ^ Ertel 2001, p. 72. ^ "QSL9 for Agriculture (Tier 4 Interim)". Cummins Engines. Retrieved 2018-06-11. ^ "Versatile - MFWD Tractors". www.versatile-ag.com. Retrieved 2018-06-11. ^ "GENESIS® T8 Series – Tier 4B - Overview | Tractors ＆ Telehandlers | New Holland (US)". agriculture1.newholland.com. Retrieved 2018-06-11. ^ "Track Technology | Quadtrac and Rowtrac Tractors | Case IH". Case IH. Retrieved 2018-06-11. ^ "John Deere Tractors | Row Crop Tractors | John Deere US". www.deere.com. Retrieved 2018-06-11. ^ Pripps & Morland 1993, p. 28. ^ Leffingwell 2004, pp. 43–53. ^ Splinter, William (January 2012). "THE BIOL OGICAL SYSTEMS ENGI NEER ING PR OGRAM IN NEBRA SKA 1895–2011". Biological Systems Engineering: Papers and Publications. Retrieved 10 January 2018. Ertel, Patrick W. (2001). The American Tractor: A Century of Legendary Machines. Osceola, WI, US: MBI. ISBN 978-0-7603-0863-9. Klancher, Lee; Leffingwell, Randy; Morland, Andrew; Pripps, Robert N. (2003). Farm Tractors. Crestline [Imprint of MBI]. ISBN 978-0-7603-1776-1. Leffingwell, Randy (2004). Ford Farm Tractors. Motorbooks Classics Series. Osceola, WI, US: MBI. ISBN 978-0-7603-1919-2. Miller, Orrin E. (2003). "John Froelich: The Story of a Man and a Tractor". In Macmillian, Don. The John Deere Tractor Legacy. Voyaguer Press. ISBN 978-0-89658-619-2. Pripps, Robert N.; Morland, Andrew (photographer) (1993). Farmall Tractors: History of International McCormick-Deering Farmall Tractors. Farm Tractor Color History Series. Osceola, WI, US: MBI. ISBN 978-0-87938-763-1. Look up tractor in Wiktionary, the free dictionary. Wikimedia Commons has media related to Tractors. ACC: Farm safety: Vehicles, machinery and equipment. This page was last edited on 18 April 2019, at 08:26 (UTC).